THE top sides of the Northern Territory Football League (NTFL) Men’s Premier League came to play on the weekend, all gaining wins over bottom four sides as the gap between fourth and fifth widened to eight points and considerable percentage. Tiwi: D. Munkara 5, A. Tipungwuti 3, B. Palipuaminni 2, G. Cunningham 2, K. Kantilla, R. Tungatalum. Nightcliff: T. Melville 10, W. Derksen 4, B. Filo 2, S. Deery 2, M. Bricknell, N. Green, L. Holt-Fitz, C. Ilett. A ten-goal masterclass to Nightcliff’s Trent Melville was the highlight in the Tigers’ 47-point win over Tiwi Bombers. There was no shortage of scoring between the sides, with 36 goals kicked for the day, with Melville being one of four players to kick more than two goals in the match. Teammate, Wade Derksen slotted through four majors, while for the Bombers, Dionysius Munkara finished with five goals, and Adam Tipungwuti managed three. Munkara and Melville were their respective teams’ best in the match, with Brodie Filo (two goals) and Cameron Ilett (one) also named in the winners’ best. For Tiwi, Jason Puruntatameri and Justin Copper were named in the best. The Tigers’ win kept Nightcliff just four points off top spot and percentage behind second spot, while for the Bombers, they are still searching for their first win of the season. Waratah: A. Ankers 3, R. Bulluss, A. Ellis, J. Beugelaar, A. Aurrichio, S. Godden, J. Stevens, C. Barrett. Waratah has ensured an eight-point gap between the top four and bottom four with a 24-point victory over fifth placed Wanderers. They led throughout the contest but could never fully shake Wanderers off until the final siren when they had opened up the four-goal final margin. Abraham Ankers was named best on ground, slotting three crucial goals in the victory, while Justin Beugelaar and Sam Godden were also named among the winning side’s best. For the Eagles, it was not about the game itself, but honouring a recently deceased teammate, Matteo Lee. While the defeat was not the result the side had hoped for they were brave in the loss, which featured the debut of Ronnie Fejo Jnr. St Marys: J. Cullen 3, J. Quinn 2, N. Paredes, M. Liddy. Darwin: D. Shillabeer 4, I. Palmer 3, T. Clarke 2, J. Clark 2, M. Rosas, J. Clarke, M. Campbell, D. Paull, B. Stokes. 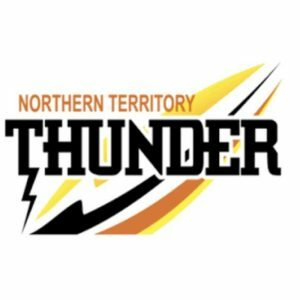 Darwin Buffaloes has retained second spot on the NTFL ladder after a comprehensive 55-point win over St Marys. It was a case of both experience and youth getting the job done, with Darren Shillabeer booting four majors, and the exciting X-factor of Malcolm Rosas giving the visitors plenty to cheer about. Thomas Clarke booted two goals on debut, while brother Jalen also hit the scoreboard, as did Ishmael Palmer who finished the game with three. Jackson Clark also booted two goals, while Rosas’ major was one of the highlights of the round with a gather at top speed and snap at goal. For St Marys, Jordan Cullen booted three majors, while James Quinn finished with two majors. Former Gippsland Power midfielder, Nate Paredes was named in the best once again, also slotting a goal, while Matthew Wilkinson was named the Saints’ best. For the winners, they had not shortage of stars on the park with Rosas, Jarrod Stokes, Joe Anderson and Tim Eldridge all impressing on the night. Southern Districts: D. Staunton 3, D. Barry 3, B. Schwarze 3, D. McLachlan 2, D. Abbott, S. Thorne, C. Gallio, C. McAdam, W. Farrer, I. Wyatt, L. Ogden. Palmerston: B. Church 2, S. Autio, N. Lockyer Jnr, B. Cripps. Reigning premiers, Southern Districts has continued its perfect start to the season with a 93-point annihilation of Palmerston. The experienced Crocs had an impressive 11 individual goal kickers as they finished the game with 39 scoring shots to 11 in a very one-sided contest. 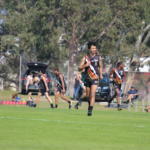 Dean Staunton was best on ground with his three-goal haul, while Beau Schwarze and Dylan Barry also booted three goals. For Palmerston, Broderick Church was the sole multiple goal kicker, finishing with two majors in the defeat. While competitive for the vast majority of the match, it was a seven goals to zero second term that effectively snuffed out any chance the Magpies had of a comeback after a five goals to one first term. Palmerston managed to boot four goals’ to Southern Districts’ six in the second half in a much tighter affair. Lionel Ogden, Sam Guilhaus and Darren Abbott were named the Crocs’ best along with Staunton, while young star and draft hopeful, Izaak Wyatt booted a goal in the win. For the Magpies, James Rhodes, Lachlan Dhurrkay and Under-18 Northern Territory representative, Rodney Baird were named in the best.